Brought to you by The Ellsworth Cooperative Creamery, our Select Artisan Cheese Collection… Antonella hand-crafted cheeses from Wisconsin. 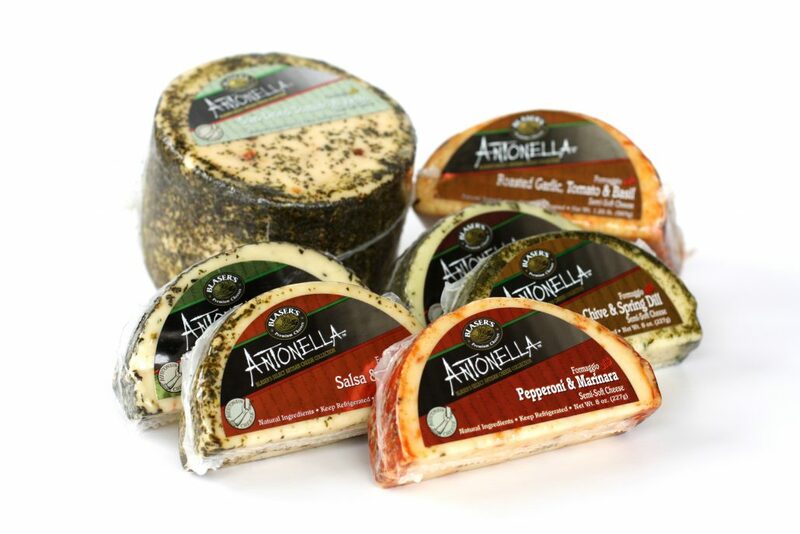 The Antonella line is a selection of pressed curd, semi-soft cheeses made with cow’s milk. Natural ingredients are used to create innovative flavor profiles. Each cheese is infused with a natural ingredient, aged and then hand rolled in a spice, lending both a sophisticated taste and beautiful appearance. These small batch cheeses have a creamy texture and, depending on age, range from a mild to a slightly sharp profile. Antonella is packaged in an appealing foil label providing an attractive addition to any deli bunker. Pasteurized milk, capers, vinegar, salt, cheese culture, black peppercorns, calcium chloride, enzymes. Pasteurized milk, cheese culture, salt, dehydrated garlic, dill, calcium chloride, dehydrated chives, enzymes. Pasteurized milk, cheese culture, salt, dehydrated scallions, rosemary, calcium chloride, enzymes. Pasteurized Milk, cheese culture, salt, dehydrated garlic, dehydrated tomato, basil, calcium chloride, caramel color, enzymes. Pasteurized milk, pepperoni (pork, beef, salt, contains 2% or less: water, dextrose, natural spices, oleoresin of paprika, lactic acid, starter culture, garlic powder, sodium nitrate, BHA, BHT, citric acid), cheese culture, salt, spices, dehydrated tomato powder, granulated garlic, calcium chloride, cayenne pepper, enzyme. Pasteurized milk, diced vegetables (carrots, celery, onion, red and green bell peppers), salt, cheese culture, vinegar, calcium chloride, enzymes, sweet basil.